More Evidence That ADHD Drugs Don't Curb Ultimate Height : Shots - Health News Some earlier research hinted that Ritalin and Adderall can hamper a child's growth. But a study of adults who took the drugs as kids now suggests any such effect is only temporary. More and more kids are being diagnosed with attention deficit hyperactivity disorder, and many are medicated — often with stimulant drugs like Ritalin or Adderall. With so many children taking these drugs, plenty of parents and doctors are concerned about potential side effects, including the possibility of curbed growth. Some studies have suggested that the drugs can cause growth to slow a bit, while others haven't found a link. Few studies have followed these kids beyond their youth to track their final heights. 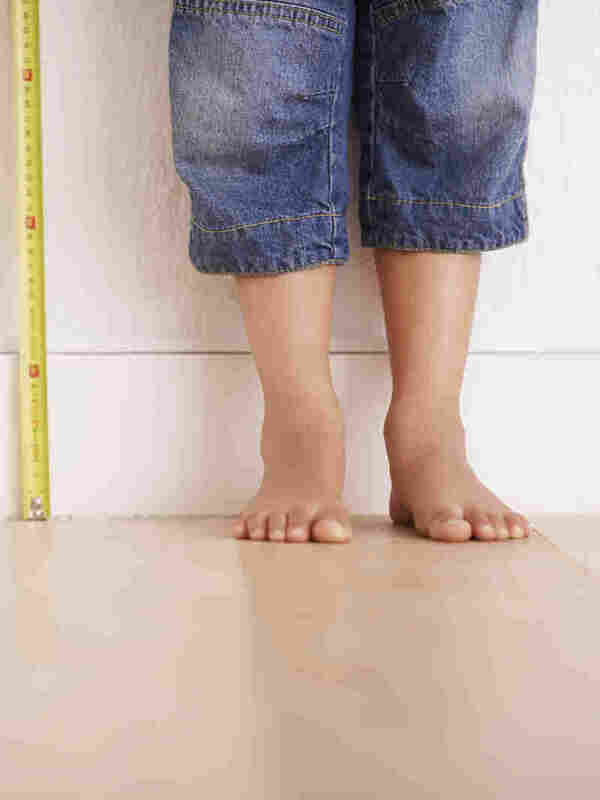 Now there's some reassuring news on that front: Research published online in Pediatrics on Monday found that children who took ADHD medicine didn't have height deficits in adulthood. Neither an ADHD diagnosis itself nor treatment with stimulant drugs was linked to a significant difference in growth or final height, compared to the average for that age and gender, says Dr. William Barbaresi, lead author of the study and a developmental-behavioral pediatrician at Boston Children's Hospital. The only significant effect was that, for boys treated with the drugs for at least three years, the medicines were associated with about a six-month delay in the peak growth spurt. But there was no significant effect on the ultimate height of those young men, says Barbaresi. Still, it's crucial that doctors continue to monitor the growth of children taking these drugs, Barbaresi says. It's possible that some in the study were taken off their meds if their growth rate raised concerns. And because of where the research was conducted, the population was mostly white, which might also limit the findings. But the research suggests that "in the real world, with clinicians making decisions, there's no long-term impact" on height, Barbaresi says. His study showed no relationship between dose or duration of treatment and adult height. The research adds to the evidence suggesting that "this is not an issue that people have to worry about," says Stephen Faraone, a psychologist at SUNY Upstate Medical University who researches ADHD. "It's a terrific study," says James Swanson, a pediatric psychologist at the University of California, Irvine who also studies ADHD. He's on a team looking into the effects of higher doses of stimulant drugs, taken over a longer period of time. Long-term data on growth from that study, he says, have not yet been published.